What makes us keep on going? 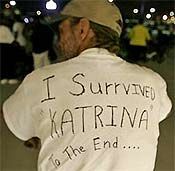 Hurricane Katrina thrashed the coastal areas of Louisiana, Mississippi, Alabama and Florida last week. If you watched the news at all, you saw the near total devastation of the great city of New Orleans. Closer to home, I saw areas of Biloxi where we once lived, and was amazed at the power of wind and water to simply erase what had once been. I listened to a lady on television describe how she had gone back to her two-story brick apartment building only to discover that it wasn't there any more. All she found that belonged to her was a shoe. I have a friend who preaches in Pascagoula. He's pretty sure his house is gone. Not only that but at this point, he fears that just about the entire church that he preached for is gone. Oh, the building is still standing; I'm talking about the people. Their houses are gone. Their jobs are gone. There is nothing to come back to, assuming they got out of harm's way. He doesn't even know if he will go back and if he does, what will be there? Still, they were headed home. I grabbed a bite of lunch today at Wendy's. And it was there that I was reminded of the resilient spirit God put into people. The place was full of refugees, most of whom were trying to figure out how to get home. Some were from south Mississippi, others from Louisiana. All were sharing similar stories. One lady said her biggest fear was that her house would be full of snakes! Still, they were headed home. One man said his wife was a nurse and she needed to get home so she could get to work. Two young guys in a short bed truck had the thing loaded down with gear. I heard someone say they had been looking for generators to take back south. The storm created a crisis. God created people to rise to the occasion. I saw people obviously displaced and displeased with the problems, but at the same time I saw people with a simple, easy determination. Not everything they were talking about seemed to me to be the smart thing to do. After all, as I write this, there is a real problem with gas for automobiles. Two guys went out the door and one said to the other, "OK, worst case scenario, how far do you think we can get if we can't find any gas?" I didn't hear the answer, but they went out, climbed into the truck and left. I can only assume they're headed home. Prayers, help, financial assistance will all be needed in the weeks and months ahead. This disaster will leave its effects for generations, I'm afraid. After all, we're still talking about Camille and this one may have been just as bad or worse. But, when all is said and done, people will survive, rebuild, and get on with life. It's the way God made us. It's courage in a crisis, long-term anyway. © All Rights Reserved. Articles may not be reprinted in any “for profit” publication without further permission by the author. Articles may be freely distributed via e-mail, reprinted in church bulletins or in other non-profit publications without further permission. Please keep this copyright and Web Site information intact with copied articles. "Courage in a Crisis" by Bill Denton is licensed under a Creative Commons License. Heartlight encourages you to share this material with others in church bulletins, personal emails, and other non-commercial uses. Please see our Usage Guidelines for more information.